Starlings are an easy bird to watch and learn their nesting, mating, and other behavioral habits such as feeding and diet. Millions of these birds inhabit the North American Continent. These birds measure 7 to 8 1/2 inches long and have a stocky build and short square-tipped tail. In summer the long pointed bill is yellow. In winter their plummage is speckled with white and its bill is blackish. Younger birds are a uniform brown with dark bills. Introduced species are those birds and animals that have been imported and not native to this continent. (N.A.) Which is the case with the European Starlings. In 1890 Eugene Scheifflin turned 60 of these birds, imported from England, loose in New York City's Central Park. Forty more were released a year later. All of this was an effort by Mr. Scheifflin to transplant all the birds mentioned by Shakespeare to the New World. The mating habits of these birds begin in late February and can continue through June. Males choose a nesting site and females choose a male. Courtship behavior consist of the male perching near his nesting site crowing and waving his wings when a female flies close by. If a female is near the males nest site, he may pick up leaves in his beak and go in and out of the nest cavity. You can tell when the two have paired when they begin to go through their activities together. Before pairing, these birds feed and fly as individuals. These birds are mainly monogamous. Although the male may change mates between broods. The nesting habits may begin as early as fall. Selecting a cavity in a building, birdhouse, or an old Woodpecker hole. These birds are very aggressive at claiming their nesting sites, often displacing more desirable native cavity nesters such as Bluebirds and Purple Martins. The male first cleans out any previous nesting materials and begins placing dried leaves, bark, moss or lichens in the cavity. When the female pairs with the male she cleans out the nest and rebuilds it primarily with grasses. The nest is usually located 10 to 30 feet above ground. The female lays 4 to 5 white, pale blue, or greenish eggs which are incubated by both the male and female during the day. At night, the female incubates the eggs. The incubation period will last for 12 days. The young will leave the nest 21 to 23 days after hatching. Both male and female feed the young. The young may be fed for 2 - 3 weeks after they've fledged. Pairs may raise up to 3 broods ( 2 broods common) each season and will reuse nest. The Starlings feeding habits are a bit unique in that they are able to open their beak while probing in the ground because of special strong muscles. This behavioral habit allows them to catch prey unavailable to other birds. This is called gaping and is also found in blackbirds. They will eat insects, spiders, worms, fruit, and seeds. At bird feeders these birds will eat seed and suet. Bird feeding may have to be stopped when flocks of these birds arrive. Otherwise you could go broke trying to keep them fed. Bird watchers also need to be aware, these birds can be very aggressive at feeders and keep smaller birds from approaching. These birds are known for usurping homes of Bluebirds, Purple Martins and other cavity nesters. When placing birdhouses, make sure the entrance hole is 1 1/2 inches or less in diameter, this size is too small for them to enter. 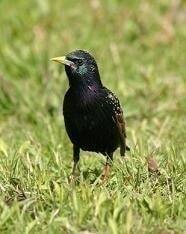 Starlings are considered a pest by farmers and city managers. Most of the focus on these birds is the impact they have on native bird species. Estimated population of starlings - 200 million.